Some people sort their laundry into piles of fabric and color. Others are lucky if the clothes make the machine at all. Our basket isn’t sorted as there has been very little time this week with briefs being filed in the Triple B (Three HMA) case with the last one filed yesterday. Our attorney worked pro bono on the Fourth of July. His “time off” was time spent fighting against abuse and our first amendment rights. Have a good weekend! Help US! Broken Arrow Tour NOW! Would you like to see the horses at Broken Arrow? Join us in asking BLM to open the facility during the heatwave to show us that the horses are ok. Email BLM head PR: Tom Gorey at “Tom_Gorey” <Tom_Gorey@blm.gov>, and ask that a tour be scheduled immediately. 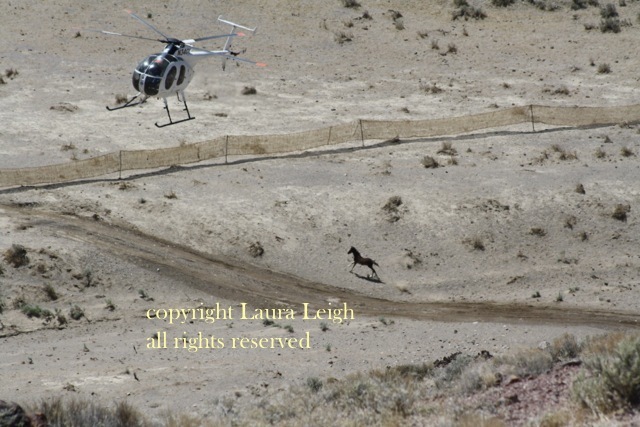 (Reno, NV) The wild horse and burro advocacy group, Wild Horse Education (WHE) is very concerned for wild horses currently held at Palomino Valley Center (PVC), north of Sparks Nevada. The group carries several legal actions that pertain to the humane treatment of wild horses. Many of the animals at the Bureau of Land Management (BLM) Palomino Valley Center came from ranges currently under the scrutiny of the court. Wild Horse Education’s President and principle researcher, Laura Leigh, visits the facility multiple times each week. What she observed yesterday was disturbing. We recieved a request to use some of our photos for a video being put together by advocate Stacy Kneeshaw Jett. After discussion we gave permission for use and the video she sent us was beautiful and tragic… a perfect representation of the plight of our wild horses and all they have given. We add it here for you to see. Clean body and soul among the wild horses! 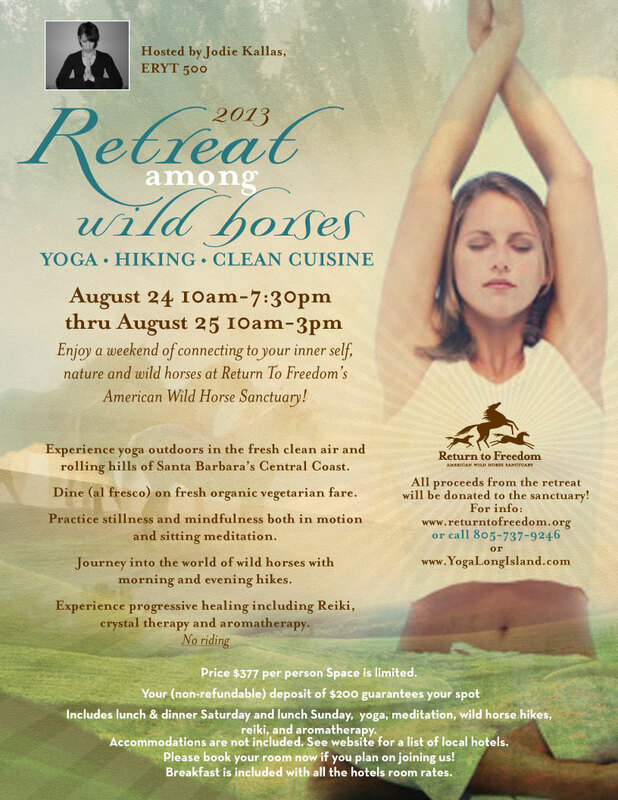 If you are near Lompoc Ca you can have yoga and wild horses too! A great combination to wash away all that ails you. NEVER has the work we are doing been so intense in the courtroom sagas! Oh yeah and we have the Owyhee hearing in ten days. Please support our work if you can. These requests can’t wait! Who’s the next best person/decision maker to contact without waiting for a week or more? And the most effective way for all of us to reach them? Do you know the “meat” inspectors are instructed to give extra scrutiny to white and grey horses to check for melanosis. Those found with excessive melanosis are condemned carcasses. The video brought tears. It is well done. I pray that many will see it & that the people we need to convince will see & pay heed. Thank you Laura Leigh & to the person who put this video together. I know you have receive a few of these requests. It seems people think you can do something about our nations wild horses. I hope and pray that you will listen to each and every one of these requests as they do indeed come from the heart. There are a lot of people in the world that don’t like to see the wild horse penned up, overheated and mistreated. Why pen them up and take away their natural defense to heat and disease. I know this about the cattle ranchers wanting all the land for their cattle. Please look at the situation with your heart and stand for something more in this long life we are given, rather than the best interests of rich cattlemen. They already have more than enough to earn a living. This has been a battle of horse or cow since America first started ranching. You can help the horse who has given man his heart and trust for a long time. They are much loved by everyone except the cattle rancher. Even they use the horse. I can’t imagine what our children will say when finally the wild horse is gone. I work around children and wild animals of all kinds inspire creativity and hope and a deep sense of wonder that is very important to the maturity of these kids. Ask a child how much they like the wild horse or the wolves or the buffalo. The elephant, the tiger, the whales, the turtles. If that doesn’t inspire you, you have lost something very important in your soul. Lets not make the ending of the story of man and animal a violent, brutal and bloody story to tell our kids.